In my quest for clean glass, I’ve scoured the universe for a solvent strong enough to reclaim my glass from the relentless grip of resin. 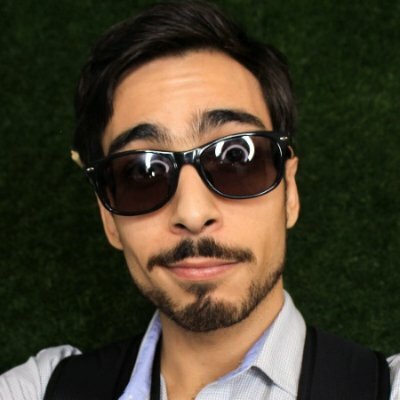 Throughout my pot pilgrimage, I’d tarnished my glass with thousands of tokes, creating a creeping ring of residue near the base of the bong. And after rigorous shaking and soaking with alcohol and salt, the stain of resin god stayed seared onto the glass’ surface. Even pots of boiling hot water failed to muster any movement from the ever present shadow. Though for the the first time in what seemed like a millenia, I witnessed the resin flaked away piece by piece cinematically – almost crying out towards it’s inevitably vanquished state. All thanks to Grunge Off. The unavoidable truth is that glass simply gets dirty. It’s impossible to keep a piece spotless, even with proper maintenance, such as using a screen/ashcatcher or rinsing with warm water after use. And while most stoners might instinctively reach for the alcohol and salt, it’s a crude option that often damages glass minutely over time. Why clean your Corvette with a cheap soap and scrubber when you know it will only erode your car over time? With the recent explosion of high quality ‘heady’ glass in the past few years, many more connoisseurs are leaning towards a higher quality, non abrasive cleaning solution. And that’s where Grunge Off comes in. 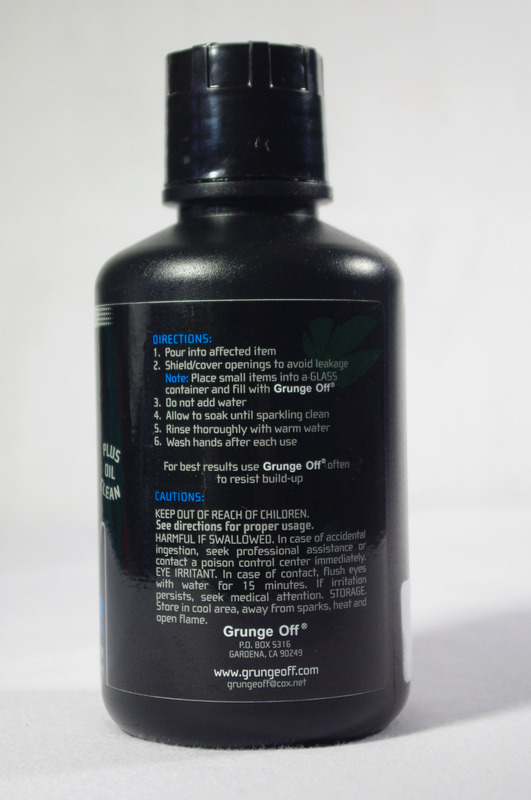 Grunge Off is easily one the best glass cleaning solutions out on the market. It’s patented and recently updated formula can force resin to relinquish it’s vice grip by simply soaking the glass in the solution. 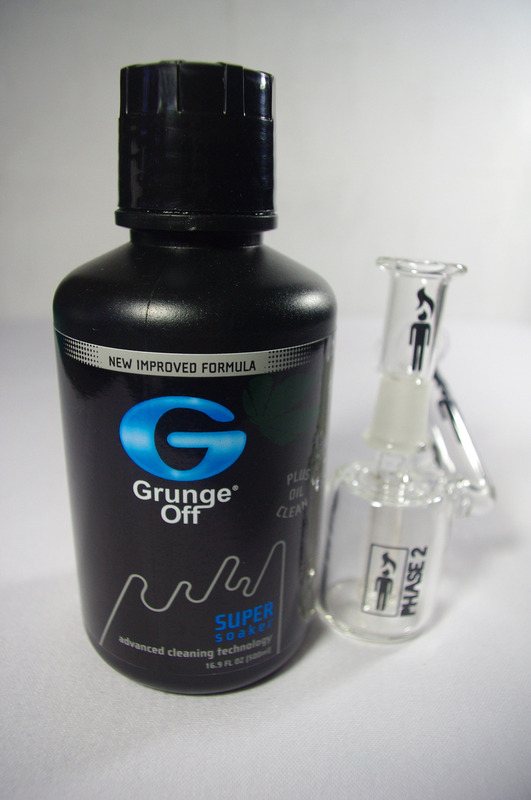 Rather than embracing abrasive salt derivatives that damage designs over time and encourage increased resin production, Grunge Off is designed to simply sit in the glass and work without agitation (much like many stoners). It’s perfect for percolators that persistently seem to attract the black plague. As most percolators are comprised of precise and complex cuts, cleaning brushes and salts have a difficult time reaching each contaminated corner. Soaking on the other hand completely saturates, allowing for a closer clean than shaking salt could achieve. 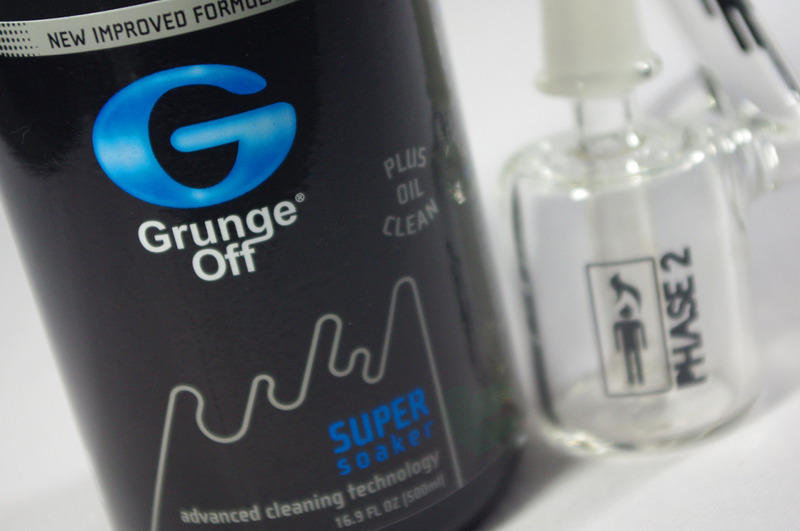 And compared to any other cleaner, particularly the piercing smell of alcohol or acetone, the sweet citrus tones of Grunge Off are the best qualities of the product. Personally, it’s odor penetrates my cerebellum and ensues to trigger a sense of nostalgia, mustering memories of washing my hands clean of car oils with gritty, orange smelling, mechanic’s soap. I can’t say nearly the same for alcohol, which tends to induce light-headedness and head-aches with it’s clearly unnatural chemical scent. It’s incredibly easy to conserve and reuse, making it an excellent investment. Whereas alcohol tends to lose it’s potency after a few uses, and 420Cleaner’s syrupy and salty composition persists a couple of uses, I’m able to use Grunge Off up to 10+ times and preserve most of it. And the best part, when you’re done with it (down the drain accidentally or due to resin density) the stuff is completely biodegradable – making it safe for the environment.